The future of jazz is now. This idea you will get immediately while listening to this sensational debut of guitarist Daisuke Abe. Even if he is a very young player he sounds like a cool cat. And his bandmates are worth listening as well. You will enjoy music that is focused on players and soloists. Since moving to New York, Daisuke Abe has been performing his unique compositions with his band in several Jazz clubs in the NYC area including Cleopatra's Needle and Kavehaz. For his debut as leader he brought together some of the hottest young jazz musicians in NYC. The band gathers up the great talents of: Walter Smith (sax) (Terence Blanchard Band), Aaron Parks (piano) (Terence Blanchard Band), Matt Brewre (bass) (Greg Osby Band), Rodney Green (drums) (Eric Reed, Greg Osby), Gretchen Parlato (vocals) (special guest! 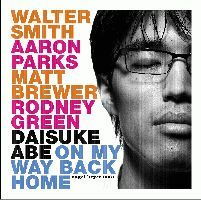 Winner of the 2004 Thelonius Monk Int’l Jazz Vocals Competition) This album contains nine of Daisuke Abe's original compositions. Daisuke Abe, born in Tokyo, Japan, started playing Guitar at age 15. He started playing Jazz at the Jazz course of Senzoku Gakuen college in Yokohama, Japan, and graduated at the head of the class of 1999. He received a world scholarship to Berklee college of music where he graduated from in Spring 2002. He was also a recipient of the "Louis Bellson Award" from this school. During his stay in Boston, he studied and played with great Jazz musicians such as Hal Crook, Tiger Okoshi, George Gazone and many others. 9 Tracks. Recorded on October 8 and 31, 2004 at Peter Karl Studio, Brooklyn, New York City.